Also, since the table of contents that my post series plugin creates has gotten far too unwieldy to include at the top of each post, I’ve gone ahead and made an index of the Cantos I’ve discussed, with links to each post. I’ll try remember to update it as I continue with this project. That index is here. The index is new, so I encourage you to check it out! Well, here we are, the last of the Chinese Cantos. It’s been a long time in coming, but I’ve finished that set, and am ready to embark upon the voyage through the Adams Cantos… soon. In any case, it may take me some time to bust through the Adams to the Pisan Cantos, where things get really interesting again, but I will get there. For now, though, it’s time for me to spin off my thoughts on Canto LXI, the final “China Canto,” and close a much-extended epoch of this project. Which is interesting as a kind of Schenkerian gloss. Of course, I’m not sure Pound really intends the contents listed to really reflect what each canto is actually “about” so much as it tracks the historical moment discussed in a given poem. That in itself is interesting and worth considering, especially since it’s in the China Cantos where Pound seems to launch into a weirdly linear chronology, after so much skipping around and superimposition of different moments in history, myth, and narrative. This is straight up hagiographic history of dynastic success, of course bearing in mind Pound’s slant against Christianity. The first page of the canto is fairly focused on the handling of Christianity by the Qing emperor “Yung Chêng” (or, as we know him now, the Yongzheng Emperor). Pound’s adulation in part seems to be tied to this emperor’s antipathy towards Christianity, but also a general track record of what a Canadian like me might tend to call “good governance”: punishing graft and fraud and the victimizing of the poor, oppressive tax collection, and sensible policies for famine preparation, that sort of thing. This of course brings back to mind Pound’s other obsession: with currency systems and banking. If it were possible to tell an exciting story about banker heroes, one imagines Hollywood would surely, by now, have found it. Good kings tend to be somewhat boring in the same way, and praise of sensible fiscal and development policy ends up often sounding much like hagiography, and just as boring. yellow as fit for this purpose. I can’t help but wish Pound had been as interested in the mythology and folk religions of China as he was in that of Europe: with what Western mythological being what would he have rhymed Shennong, the primal “first farmer” of Chinese mythology? This, again, I think is where the China Cantos somewhat fail: Pound cordons of China and treats it in the way de Mailla does. Maybe there was a lack of access to documents, of course; or maybe Pound wanted China to be a sort of isolated test case or historical control. I’m not sure, but the richness of the first forty Cantos would have continued on into the China Cantos if Pound had been able to engage with figures like Shennong. The Ancient Agriculture Temple, in Beijing, which if I ahve my facts right was dedicated to Shennong. Photo by Peiyu Liu. Click for source page. and the price of grain kept goin’ up. Or do these Juglers cheat our Eyes? Here’s ev’ry Piece as big as Ten. Sight, Behold it swelling like a Sop. Pound’s apparent insistence that a poem could “contain history” (meaning anything within history, which is to say anything at all) is not really odd or new: there was a time when it was taken for grated that even London pub guides should be written in verse. Pound here is being oddly (if characteristically) archaic, if anything. Even an astonishing story like that of the peasant Chiyeou somehow comes across as flat: the peasant found a purse of money, honestly turned it in, and was rewarded opulently by the emperor… uh, okay? It’s grist for the mill of showing the mentality of the Yongzheng Emperor, but, well, I suppose here’s something: Pound moralizes, but not as often as we might think. More often, he alludes, and lets us make of the allusions what we like, in the earlier Cantos. Terrell certain expresses opinions about the allusions and what they mean, and suggests whether Pound’s attitude is positive or negative. In the China Cantos, Pound alludes much less, and states much more. One wishes he’d done the opposite, or at least I do, for the allusions were a major attraction of the early Cantos for me. (the Happiness ideogram) that I have sent you. Doesn’t this sound a bit like the whole self-reliance schtick so fundamental to the old 19th century American ideology? (Or, you know, still in full force in certain areas of the country even now?) It does to me, at least. The same character, in different hands/stamps. So then what about “KIEN”, his successor the Qianglong Emperor? From the rough sketch Terrell presents, the Qianlong Emperor seems like one of those types to which Pound really, really was irresistibly attracted: he had the strongman elements (subduing rebellion in West China, forcing tribute from Burma and Nepal, and establishing territorial control of Tibet); he spent a decade (that is, a lifetime in American politics even in Pound’s time, and a century in our political world) complete reorganizing his government; he was an active (if mediocre) poet and patronized and directed a great deal of publishing in China under his reign. What’s not to love? Pound gives us dispatches from the front—stuff about melting down cannon and preserving Muslim treasures in Xinjiang and what was once Chinese Turkestan (now West Uzbekistan). But Pound’s excitement seems… subdued. also seems eager to move on: he refers to the Adamses, a hint of what’s to come in Canto LXII, and to the American Revolution. Pound’s decision to focus on Yongzheng seems to line up nicely here too: John Adams was born in 1735, the last year of Yongzheng’s rule. According to Pound (and presumably Mailla), in this period the influence of the West waned in China. A few Jesuits were tolerated, but their faith was not, and despite a random Italian ambassador’s appearance in these lines, the emperors at hand seem very much more wary of the West—a fair instinct, given that a century later, we have the Opium Wars and Westerners getting involved in the Taiping Rebellion. 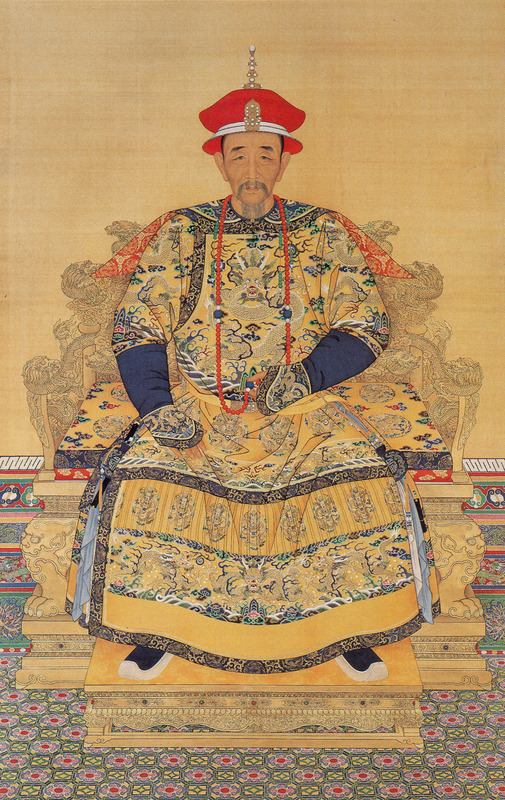 Hong Xiuquan, leader of the Taiping Rebellion. I actually shot this one myself at the Taiping Rebellion Museum in Nanjing. Personally, I really wish Pound had progressed through the rest of Chinese history, if only for a chance to see what he made of that latter event: the Taiping Rebellion happened during his father’s lifetime, and was enough within living memory that the name Gordon was still popular into the 1930s (in honor of “Chinese” Gordon, also known as “Gordon of Khartoum,” who played a major role in the conflict). Pound doubtless would have been caustic about the Chinese rebel who styled himself the son of Jehovah and the little brother of Christ, but we’ll never know. I do wish I had some of the sources on Pound and China that I had access to back at my old workplace. Pound may have first encountered the characters of Chinese writing in their Japanese form, but he actively corresponded with Chinese scholars in his own lifetime, and I believe the letters would be helpful in breathing some life into these otherwise somewhat dull poems about what is mostly ancient history. Likewise, how Pound might have opined on the end of the Chinese Imperial rule, and on the modernization of China, is at least a topic for elsewhere: it’s the 1700s, and Pound’s done with China for now, so we are too. We’ll continue to see Chinese characters in the text, but this sums up Pound’s longest and deepest engagement with Chinese history, as part of the project of the Cantos. Next time, we’ll be continuing with Canto LXII, the first of the Adams Cantos. Some thoughts, before I completely finish, however, on that speculative occult-Pound I was working on building up—the reason for this research in the first place. Pound’s approach seems to be to invest individual characters with great significance and power. Questions remain as to how that would work within the context of The Cantos, but I think for one thing, he’d be using characters that way in his thaumaturgy, too: no long spells, just specific characters written in the right ink having possibly magical effects. Pound’s essentially pulp worldview seems to shine through when it comes to China: there’s the wise rulers, the idiots, the bad women, the budzers and taozers and Jesuits, and the line of succession. Well, and there is poetry and art and learning, which are the province of the wise rulers. One wonders what Pound would have made of our latter-day conviction that there are no truly “wise” leaders, only better or worse, or just politicians who are all flawed and compromised, though some are more so than others. One suspects he would not have liked that notion one bit, and one suspects that’s why was willing to lie so hard to himself to imagine Mussolini meant anything by his comment about The Cantos. Narrative-wise, I feel like at this stage of his career Pound would be frustrated and desperate to be producing the Cantos, the book he knows he must write in order to “contain” history. He opts to render de Mailla in verse, and does it, but his artistic payoff is low compared to the earlier Cantos, and he’s trying to find a way to connect it all to the West. Or maybe he’s trying to “lock down” Chinese history for some special reason? Given the number of times Pound throws around terms like “jap” and “chink” I find it a little surprising that people dwell so little on that alongside his anti-Semitism. I can only guess that people are way more sensitive to the latter, even now (and way less willing to engage in “man of his time” arguments for the latter, too), but also that probably not many people make it far enough through the Cantos to be upset by the racial epithets used on Asians. Then again, we see Pound using Chinese character, and writing a hundred pages of cantos about East Asian history with both good and bad guys in it: there’s some degree of respect evident there, despite the nasty language, where I don’t see the same for Jewish people and their history in his work. Still, it’s another set of slurs that are jarring… or would be, at least, if we didn’t know Pound as we so long and so deeply have come to know him. Right, that’s it till next time, when I start with the first of the Adams Cantos. So glad you are keeping this up (EP would have probably said “plugged along”). I have a little digital magazine called Make It New, which belongs to the Ezra Pound Society. I would like to advertise your blog a little, especially so since you had a break from before the mag was started. I hope this is OK with you? I don’t very well know how to do it this time. Usually I have a webpage that I use as a big image, a headline and some lines of text with link underneath. The mag has a “print” version as well, so I am thinking of what fits on a page. Let me know if you have some ideas or whether maybe you’d like me to use a certain text. Index: great idea! just need to check out what you wrote on canto 11! Thanks! I’m glad to be back on task and plugging along. I have no problem, and really nothing but appreciation, for your offer to advertise the project. I’m not sure what would work, but I could kick around a few ideas and see if I come up with anything, if you like. I think as long as your advertisement includes the title of the series, I’d be happy. Make it New looks like a good resource: I’ll have to dig in when I’m less overloaded with the beginning of the semester (which started this past week) and the novel I’m working on at the moment! Huh? I had a look at the post but don’t get the reference! To your Huh: I’ve also started a website called The Cantos Project and I am annotating canto 11 (have just finished). The site is completely different from yours so please do not think there is any competition. I started it at the end of 2014 slooooooowwwwwwllllyyyyy. Now I’m working quicker. Hence my (professional but also fan-like) interest in your work on The Cantos.